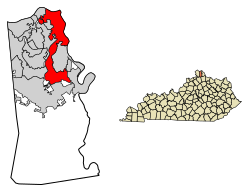 Location of Covington in Kenton County, Kentucky. Covington is a city in Kenton County, Kentucky, United States, located at the confluence of the Ohio and Licking Rivers. Cincinnati, Ohio, lies to its north across the Ohio and Newport, Kentucky, to its east across the Licking. 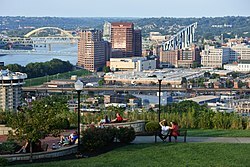 Part of the Cincinnati–Northern Kentucky metropolitan area, Covington had a population of 40,640 at the time of the 2010 U.S. census, making it the fifth-most populous city in Kentucky. It is one of its county's two seats, along with Independence. The initial American settlement at Covington was known as The Point, from its position at the confluence of the Licking and Ohio Rivers. When it was laid out in 1815, it was named in honor of Gen. Leonard Covington, who was killed at the Battle of Crysler's Farm during the War of 1812. In 1814, John Gano, Richard Gano, and Thomas Carneal purchased The Point, 150 acres (0.6 km2) of land on the west side of the Licking River at its confluence with the Ohio, from Thomas Kennedy for $50,000, and laid out the settlement of Covington the next year. The town was formally incorporated by the Kentucky General Assembly a year later and raised to city status in 1834. The city prospered as an emporium for Kentucky's tobacco and cigar production. In 1862, Stewart Iron Works was established; for a time, it was the largest iron fence maker in the world. There were also distilleries, glassworks, and stove factories. Like nearby Cincinnati, Covington's factories and businesses were particularly staffed by Catholic and German immigrants. Its Catholic church was eventually raised to the level of a bishopric. By 1900, Covington was the second-largest city and industrial region in Kentucky. At the time, its population of almost 43,000 was about 12% foreign-born and 5% black. Before World War I, it was connected to the Chesapeake & Ohio and Louisville & Nashville railways and offered steamboat service to ports on the Ohio River. Its factories had expanded to include cotton goods, machinery, and cordage. Covington even boasted a Federal League baseball team, the Covington Blue Sox, during the 1913 season. The present-day circuit courthouse is located at the site of its former grounds, Federal Park, which is thought to have been the smallest stadium ever used by a professional baseball club. It declined in importance during the Great Depression and the middle 20th century. The city has undergone some redevelopment during the late 20th and early 21st centuries as the most populous city in Kenton County. Covington claims 19 distinct neighborhoods, ranging in population from several hundred to 10,000 people. Many of the neighborhoods are located in 12 historic districts that are predominantly found in the northern portion of the city. Most of the neighborhoods have active resident associations or block watches that are dedicated to involving residents in strengthening their neighborhoods, improving safety, housing, and beautification. According to the United States Census Bureau, Covington has a total area of 13.7 square miles (35 km2), of which 13.1 square miles (34 km2) is land and 0.5 square miles (1.3 km2) (3.88%) is covered by water. Covington is located within a climatic transition zone; it is nestled within the southern end of the humid continental climate zone and the northern periphery of the humid subtropical climate of the Upland South, with hot, humid summers and cool winters. Evidence of both a humid subtropical and humid continental climate can be found here, particularly noticeable by the presence of plants indicative of each climatic region; for example, the southern magnolia (Magnolia grandiflora) from the subtropics and the blue spruce from cooler regions are successful landscape plants in and around Covington. As of the census of 2000, 43,370 people, 18,257 households, and 10,132 families resided in the city. The population density was 3,301.3 people per square mile (1,274.4/km²). The 20,448 housing units averaged 1,556.5 per square mile (600.8/km²). The racial makeup of the city was 87.05% White, 10.14% African American, 0.24% Native American, 0.34% Asian, 0.03% Pacific Islander, 0.63% from other races, and 1.57% from two or more races. Hispanics or Latinos of any race were 1.38% of the population. Of the 18,257 households,28.8% had children under the age of 18 living with them, 34.3% were married couples living together, 16.5% had a female householder with no husband present, and 44.5% were not families; 36.5% of all households were made up of individuals and 12.0% had someone living alone who was 65 years of age or older. The average household size was 2.31 and the average family size was 3.08. The age distribution was 25.9% under the age of 18, 10.0% from 18 to 24, 33.3% from 25 to 44, 19.0% from 45 to 64, and 11.9% who were 65 years of age or older. The median age was 33 years. For every 100 females, there were 95.9 males. For every 100 females age 18 and over, there were 92.0 males. The median income for a household in the city was $30,735, and the median income for a family was $38,307. Males had a median income of $31,238 versus $24,487 for females. The per capita income for the city was $16,841. About 15.5% of families and 18.4% of the population were below the poverty line, including 25.0% of those under age 18 and 13.4% of those age 65 or over. Covington has some of the least expensive real estate in Kentucky; the median house price in Covington is around $95,430, while the median house price for Kentucky as a whole is $124,100. Bus transit is served by TANK. 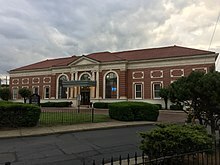 Covington is served by Cincinnati/Northern Kentucky International Airport (CVG), which is the largest airport in the state, and is hub to passenger airline Delta Air Lines and headquarters of its Delta Private Jets. The airport is one of DHL Aviation's three superhubs, serving destinations throughout the Americas, Europe, Africa, and Asia, making it the seventh-busiest airport in the U.S. based on cargo operations. CVG is also a focus city for Frontier Airlines and is the largest O&D airport and base for Allegiant Air, along with home to a maintenance for American Airlines subsidiary PSA Airlines and Delta Air Lines subsidiary Endeavor Air. Public education within Covington is provided by Covington Independent Public Schools, the largest independent school district in Kentucky. Its high school, Holmes Junior/Senior High School, is the oldest public high school in the state. The Roman Catholic Diocese of Covington operates two high schools in the city, Covington Latin School and Holy Cross High School. Two Catholic high schools, the all-boys' Covington Catholic High School and all-girls' Notre Dame Academy, moved to neighboring Park Hills in the 1950s. Calvary Christian School, a Baptist school, is also located in Covington. Saint John the Evangelist Church as seen from the east side of I-75. Mike Battaglia, NBCSports analyst and long-time Kentucky Derby announcer, was born in Latonia. Gary Bauer, former Republican presidential hopeful, was born in Covington. Daniel Carter Beard, youth leader, his life-sized bronze statue, created by sculptor Kenneth Bradford, stands in town. Adrian Belew, musician, vocalist and guitarist of King Crimson since early 1980s, was born in Covington. Gail Borden, inventor of condensed milk, lived in Covington during his childhood. Jamour Chames, visual artist, was born in Covington. Steve Cauthen, U.S. Racing Hall of Fame jockey, was born in Covington. Bob Charles, Australian politician, member of the Australian House of Representatives, was born in Covington. Frank Duveneck, realist painter, was born in Covington. Mitch English, national television personality, a host of The Daily Buzz also featured in theatrical releases and other television programs, was born in Covington. Henry Forrest, U.S. Racing Hall of Fame Thoroughbred racehorse trainer, was born in Covington. Frederick William Franz, religious leader and theologian, fourth president of the Jehovah's Witnesses, was born in Covington. Haven Gillespie, songwriter, remembered primarily for "Santa Claus Is Coming to Town", was born in Covington. Nannie Emory Holding, Covington native, was a 30-year superintendent and the namesake of the former Holding Institute boarding school in Laredo, Texas. Daniel Henry Holmes, businessman and founder of D.H. Holmes in 1849 in New Orleans; department store was largest in South at his death; he built Holmesdale, a 32-room mansion, in Covington and lived here part-time. David Justice, Major League Baseball player, graduated from Covington Latin School. Durward Kirby, television personality, best known as co-host of Candid Camera, was born in Covington. Jared Lorenzen, professional football quarterback, backup to Eli Manning for Super Bowl XLII champion New York Giants, was born in Covington. Randy Marsh, Major League Baseball umpire, graduated from Covington Holmes High School. Una Merkel, film and Tony Award-winning stage actress, was born in Covington. Lee Roy Reams, Broadway actor, was born in Covington. George Remus, lawyer and bootlegger during the Prohibition era. Jack Roush, champion NASCAR owner of Roush Fenway Racing team, was born in Covington. Pat Scott, All-American Girls Professional Baseball League pitcher, was born in Covington. Dorothy Spencer, film editor, four-time Oscar nominee, was born in Covington. Tom Thacker, NCAA and NBA champion basketball player, top pick of 1963 NBA draft, was born in Covington. Paul Walther, professional basketball player, was born in Covington. Ron Ziegler, White House Press Secretary during President Richard Nixon's administration, was born in Covington. ^ "Joseph U. Meyer". City of Covington, KY. Retrieved January 26, 2019. ^ Covington, Kentucky QuickFacts U.S. Census Bureau. Retrieved March 11, 2013. ^ Gannett, Henry (1905), The Origin of Certain Place Names in the United States, Washington: Government Printing Office, p. 94 . ^ a b Our History City of Covington. Retrieved March 11, 2013. ^ "Center for Great Neighborhoods of Covington". Archived from the original on January 26, 2014. Retrieved March 3, 2014. ^ "MONTHLY AVERAGES for Covington, KY". 'The Weather Channel. Retrieved May 26, 2010. ^ "Kentucky Homes For Sale By City". Kentucky Real Estate Trends. RealEstate.com. Archived from the original on November 5, 2012. Retrieved January 21, 2013. ^ TANK Destinations Transit Authority of Northern Kentucky. Retrieved March 11, 2013. ^ Comprehensive Annual Financial Report for the Fiscal Year Ended June 30, 2018 (PDF). City of Covington, Kentucky. November 29, 2018. p. 132. Retrieved February 5, 2019. ^ "Interview with Artist Jamour Chames". Noragouma.com. Retrieved on October 16, 2016. ^ "John H. McNeely, "Holding Institute"". The Handbook of Texas. Retrieved September 30, 2009. "Covington" , 'Encyclopædia Britannica, 9th ed., Encyclopædia Britannica, 9th ed. , New York: Charles Scribner's Sons, 1878, p. 531 . "Covington" , 'Encyclopædia Britannica, 11th ed., Encyclopædia Britannica, 11th ed. , Cambridge: Cambridge University Press, 1911, p. 315 . Wikimedia Commons has media related to Covington, Kentucky. Wikivoyage has a travel guide for Covington, Kentucky. Covington Journal, Google news archive. —PDFs of 873 issues, dating from 1849 to 1876.